Here at Quotacy, every carrier we work with offers Term Life Insurance – complete coverage that protects families by making sure that a person’s income can be replaced if they pass away while they’re working. Every term life insurance policy we offer pays out in almost every situation, whether the death is caused by an accident or illness. However, many companies have begun to offer what they call “beginner” life insurance policies – plans that protect their clients against a only few types of death, but don’t require a lengthy application. While it’s appealing to get coverage quickly, they often don’t offer the complete protection that many families need. You can spot these plans by looking at what they cover. If they cover accidents, but not illnesses, you might be dealing with one of these misleading “beginner” plans. This type of insurance is typically called AD&D Insurance, which stands for Accidental Death and Dismemberment. While it does cover your life in some very specific circumstances, if you die in any way that isn’t exactly specified in the policy, your beneficiaries may be left with nothing. Because of this, While any protection you can give your family helps, financial advisors typically argue against only having AD&D coverage if you can afford an actual life insurance policy. This blog will dive into the differences between AD&D coverage and traditional life insurance to help you find the best coverage for your family. Basically, an AD&D policy is a contract that protects you only in the event of an accident, while traditional life insurance protects you whenever you would die by (almost) any means. For example, both an AD&D policy and a life insurance policy would pay out to your beneficiaries if you were to die in a car crash or by falling down a flight of stairs. However, if you have a heart attack, or lose a long battle with cancer, only a life insurance policy would pay out. 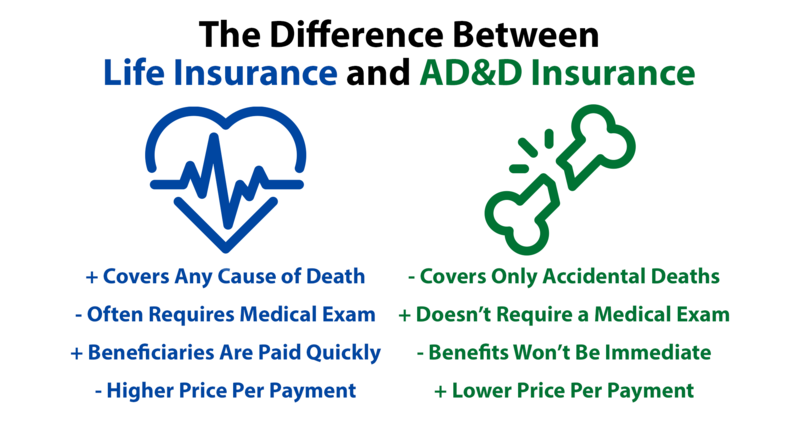 One advantage that AD&D has over traditional life insurance, however, is the fact that you could receive the policy’s payout in the event of an accident-related dismemberment or disabilities. For example, if you are in a car crash and lose your sight in one eye due to a head injury, an AD&D policy would pay out a portion of your policy’s face amount to help you pay for medical expenses or simply to help you get back on your feet. However, some life insurance companies offer optional riders that add AD&D coverage onto a traditional term life policy. 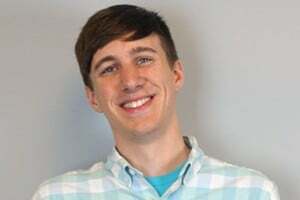 This means that if you die due to an accident while covered under a life insurance policy with an AD&D rider, your beneficiaries could receive up to twice your face amount – one payout equal to your face amount from the life insurance half of the policy, and another payout from the AD&D rider. An AD&D policy is a contract that protects you only in the event of an accident, while traditional life insurance protects you whenever you would die by (almost) any means. Both AD&D and traditional life insurance policies have certain exceptions in the types of deaths they’re able to cover, and it’s always important to read the fine print and understand fully how you’re being protected when you decide to purchase coverage. Death by suicide within the first two years (or within one year if you’re in North Dakota). Because an AD&D policy covers fewer ways to die, the application process is much faster and less strict. Because they don’t cover deaths related to illness or health conditions, AD&D policies don’t require medical records or a medical exam. You could complete an AD&D application in just a few minutes, if you know what you’re doing. Life insurance applications, on the other hand, need to take into account your medical history, and health conditions, since the policy will also need to cover health-related deaths. This makes applying for life insurance a much longer process, due to the fact that an exam needs to be scheduled and your doctor needs to send in their records. Because life insurance policies have such thorough applications and offer comprehensive coverage, they don’t often need to investigate the circumstances of the insured’s death – if you’re dead, you’re dead, after all, and life insurance covers almost all causes of death. This means that the payout on your policy comes very quickly after the insured person dies. With an AD&D policy, carriers will only cover deaths related to accidents, so they need you to prove that the death was truly accidental in nature in order to receive your payout. This can also mean that carriers can contest your payout if the circumstances around the death are ambiguous or not covered by the policy’s terms and conditions. All insurance products are priced based on the likelihood that the insurance carrier will need to pay out the value of the policy – a lower chance of needing to pay hundreds of thousands of dollars to a policy’s owner means that the carrier will be willing to issue contracts at a lower price than if there’s a higher chance of paying. AD&D policies, which only cover a small proportion of possibilities, are relatively cheap because the possibility of dying in a way that would trigger the payout is comparatively low. Because life insurance policies are more inclusive than AD&D policies, there are more ways for a person to die during the policy’s term in a way that will trigger a payout. This means that life insurance needs to be more expensive to offset that risk – otherwise, life insurance companies would not be able to keep their doors open. Life Insurance policies and AD&D coverage are wildly different types of coverage with very different situations in which you’d want to invest in coverage. You aren’t healthy enough to be accepted for a traditional life insurance policy, but still want to offer your family some coverage. You’d like to protect yourself with compensation in the event of accident-related dismemberment. According to most advisors, Term Life Coverage is typically your best option if you’d like to protect your family. It’s wise to protect your family with term life coverage if you’d like simple, guaranteed coverage for your family in the event of your death. Here at Quotacy, we can help you find a term life insurance policy that fits your needs, and even suggest an AD&D rider if you’d like to add accident coverage. You can run a quick, free, and anonymous term life insurance quote here. It’s a simple two-minute online form, and you might be surprised at how little it could cost.